Apples, pears and ginger open up a fascinating new raw food experience – here is the recipe that you can make yourself. 1. Chop all the ingredients into suitably sized pieces and juice them alternately. 2. Serve the juice in an attractive glass. Remove the hard stalks; the rest of the apples and the pears can be turned into juice. Only peel the fruit if it has been waxed. If the apples are floury it is probably better to use them for apple sauce. 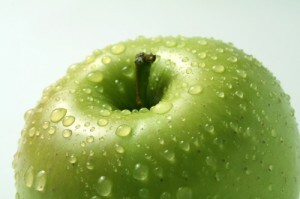 Firm, crispy apples are more suitable for juicing. Take your time. If you try to extract the juice too quickly, you will more likely produce puree. Always push the pieces of fruit into the Green Star™ with the skin at the top as this helps the pieces get drawn in far more easily. You can use the fresh ginger with its skin. Make sure that it is very aromatic and hot. A little ginger goes a long, long way, so don’t overdo things at the start. This entry was posted in Juice presses/Juicers, Raw food recipes. Bookmark the permalink.